Various TV, Films and Other. Ancient Mayan, Inca & Aztec. Famous Wills, Death Cert & Aut. Waterworld Prop Smoker Rifle, Kevin Costner, Screen Used Very Cool Item. The movie Waterworld is a post-apocalyptic story about a mutant named Mariner (Kevin Costner). As the polar ice-caps in the world have all melted, very little land remains, causing some humans to mutate into growing fins and gills, to adapt to their new environment. Normal humans' however, hate, shun and attempt to kill what they consider to be unnatural creatures. Mariner (Costner) is captured by a floating village, in which dirt is more precious then gold, and orange trees are worth an arm and a leg. During his execution, locked in a cage, the settlement is attacked by'smokers', the villains, saving Mariner (Costner). He makes a lucky escape, reluctantly saving Helen (Jeanne Tripplehorn). Mariner then proceeds to find a legendary piece of land Mt. Everest, which is still dry and habitable by land-living humans. Defeating the'Smokers' on the way, Mariner, Helen, and Helen's adopted daughter manage to finally reach this paradise. This is a Prop Waterworld Smokers Rifle. The gun is made out of hard rubber with heavy wire inside. The smokers Rifle measures; 33 inches in length x 6 inches from base to top x 2 inches thick. The Prop Waterworld Smokers Rifle is in very good "Screen Used" condition. This Prop rifle was originally obtained from the famous Ellis FX Company. Ellis is Hollywoods oldest FX Company and was established in 1908. Prop Waterworld Smokers Rifle comes complete with Lettter of Authenticity from the famous Ellis FX Company. At Reel Art we are specialists in real and replica props. We are the leading authority on anything having to do with 007, Indiana Jones, Science Fiction and more. We are also fanatics on Ancient Mystery, Religious Riddles, Conspiracy Theories, UFOs and Oddity artifacts. We continue to strive to be a top notch quality company where you can rest assured that your needs will be addressed. If you are interested in a particular subject and see nothing listed in our store please contact. We can let you know if we have something or maybe put you in touch with someone who does. We are more than happy to answer any of your questions about which product is right for you - just get in touch. Thank you for shopping with Reel Art. Please note that all payments must be in USA Dollars. Please be sure to express if you need items by a certain date so we can be aware and also we can give you a estimate of arrival time. However in USA the post office does not guarantee anything. If that is a problem please ask ahead of time whether they are in stock or not. For foreign customers we will address their specific needs also. We aim to answer any questions or queries quickly and in most cases within 24 hours. All items are described as accurately as possible and photographs are of the actual items. We are sure we can work out any problems. We strive to be a top notch company. Please do not send items back without authorization. Your return must be received back to our warehouse in the manner it was sent in original box unused. Any item item received back used or soiled may be subject to service charges and possibly refusal of return. You will be responsible for the cost of returning the item to us. This listing is currently undergoing maintenance, we apologise for any inconvenience caused. 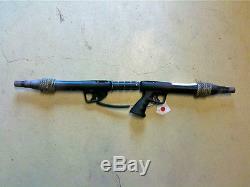 The item "Waterworld Prop Smoker Rifle, Kevin Costner, Screen Used Very Cool Item" is in sale since Monday, May 20, 2013. This item is in the category "Entertainment Memorabilia\Movie Memorabilia\Props\Originals". The seller is "reelart" and is located in New Port Richey, Florida. This item can be shipped worldwide.